Read­ers may recall a year or so ago this post on the com­ings and goings of some beau­ti­ful Albert Strange canoe yachts at Wood­bridge in Suf­folk. Well the Strange pop­u­la­tion on the East Coast has increased again, by one. I don’t wish to upstage Tally Ho’s 600-mile over­land jour­ney north to her new home with Leo Goolden (how could any­thing do that?) but Albert Strange’s Emer­ald has just done the same thing in reverse. Emer­ald was built in 1937 to Strange’s 1911 design Cher­ub III, which was to be his own final boat, and ever since I saw some lovely pho­tos of her about ten years ago taken on a murky day off Car­rick­fer­gus, North­ern Ire­land, I have coveted her. Hers is held by some to be Strange’s finest design, unsur­pris­ingly given his cli­ent. 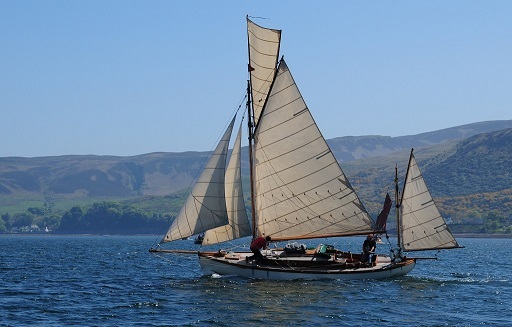 In late August the Albert Strange Asso­ci­ation learned that she had to be sold, as her skip­per Roger Clarke’s poor health pre­vents him main­tain­ing or sail­ing her, after some 25 years in Roger and Sandra Clarke’s care in which she truly graced the waters of the Clyde and the Irish Sea. I got myself north pretty quickly to her home port on the Isle of Bute, where I found her afloat and in superb order but for her eroded var­nish work, and terms were agreed for me to become her new keep­er. I spent a week scrap­ing and sand­ing her under cover there in Septem­ber, and finally had her trucked down to Wood­bridge in late Octo­ber, where I hope to get her back afloat soon­er rather than later. The jobs lined up are to com­plete tak­ing back and restor­ing her bright­work, replace the can­vas on the cabin roof, and fix up or replace the main and fore hatches. We’ll also have a look at one or two keel­bolts just in case, as they are 20+ years old. This photo was taken by local yacht­ing writer and pho­to­graph­er Gor­don Buchanan, and you can see what a beauty she is. Emer­ald’s design (i.e., Cher­ub III) is writ­ten up in our book Albert Strange, Yacht Design­er and Artist, and she is pic­tured inside in col­our, and on the back cover. Full-size cop­ies of Strange’s ori­gin­al design draw­ings are avail­able. To answer a ques­tion some of you may be har­bour­ing: Strange’s Leona, built 1906 and by just a year the second old­est Strange yacht in exist­ence, in my care for the last 18 months or so, has had her keel bolts replaced and awaits a new rud­der tube and fur­ther minor work to get her sail­ing in 2018, at which point she will be look­ing for a new owner. She is a lovely and char­ac­ter­ful boat, but Emer­ald has trumped her in my affec­tions; in prac­tic­al terms Emer­ald’s great­er size (28ft 6in vs 24ft 6in, plus great­er beam and depth) offers bet­ter accom­mod­a­tion, and per­form­ance, yet she is reportedly very handy for the lone sail­or. Should you be inter­ested in adopt­ing Leona soon­er as an advanced work in pro­gress, do get in touch.